Seki Takehiko was born 1908 in Chiba Prefecture. in 1922 he moved to Tokyo where he became an apprentice to the famed master-silversmith, Tajima Katsuyuki. Master Seki later perfected his craftmanship under master Kosaka Munehiro untll 1936 when he was able to establish himself as a silversmith in his own right. He hopes for a wider range of exposure and appreciation for craft-works made in precious metals, and for this purpose utilizes the traditional handicraft method adopting modern techniques. 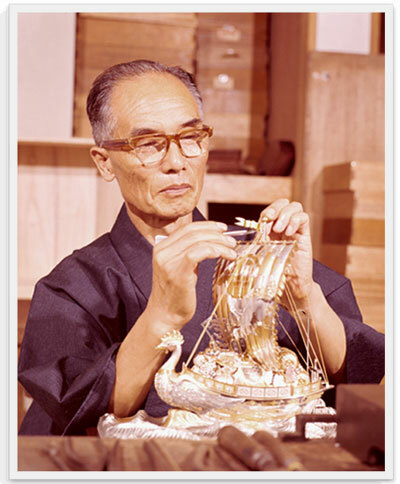 His exquisite and refined gold and silver works of art includung "Yacht","Treasure Ship","Clipper Ship","Gosho-Guruma","Kabuto","Ohgi","Japanese Crane","Lucky Mallet","Five-Storied Pagoda","Covered Wagon" and "Knight" are highly admired. Copyright © 2004 - 2018 Seki Kougei Co., Ltd. All Right Reserved.